Copies of my new, third full poetry collection arrived yesterday. I am thrilled with how handsome they look and cannot wait to share the poems with readers and listeners. Order your copy from the Shoestring link above or come along and buy one at the launch events on Oct 4th, 17th, 26th and Nov 29th. This is Sue Dymoke’s second full collection, following The New Girls – new and selected poems (published in 2004 by Shoestring Press). 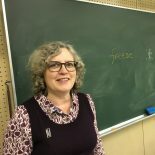 Sue lives in Nottingham and lectures at the University of Leicester where she specialises in teaching, researching and writing about the teaching of poetry. In 2011 she was awarded a National Teaching Fellowship in recognition of her work in poetry education. Her publications include:Teaching English Texts 11-18 (Continuum); Drafting and Assessing Poetry (Paul Chapman Publishing); and, with Andy Croft, Not Just a Game: Sporting Poetry (Five Leaves). She can be heard reading her poetry atbit.ly/HlwslB. Sue Dymoke’s ambitious new collection brings together poems of considerable range. Moon at the Park and Ride contains love poems, poems in which Dymoke trains her satiric though never dismissive eye on manners and matters of our age, some vivid studies in topography both local and arising from travels in New Zealand and Canada, besides a number of more meditative poems. But for all the variety of approach, Dymoke brings to her work a customary care for the craft of making. This is a rewarding collection by a widely-admired poet.